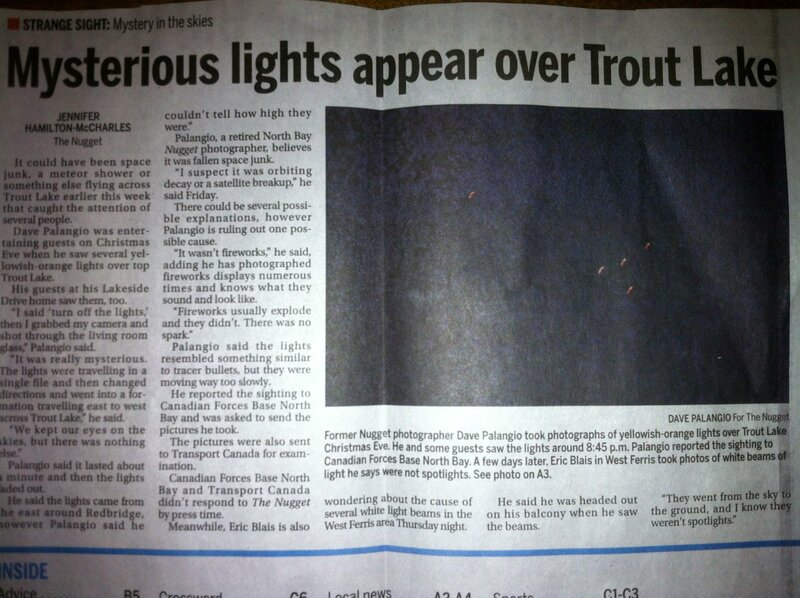 Matt Setchell, amateur UFOlogist from North Bay, sent me scans of these two articles published in the North Bay Nugget on January 3, regarding the sightings of red-orange balls of light that were seen in that area on Christmas Eve. "Hey Michel, I finally got this written up. If you see any grammatical mistakes or wording that needs editing, please do feel free to do so. Hope this helps your cause, people need to open up away from a one-track way of thinking. Cheers! Shape/Figure - 5 red-orange opaque lights. Lights seem to be pulsating.  At approximately 8:40 pm, a series of red-orange lights were observed coming from the East side of Trout Lake, bearing west along the lakehead. 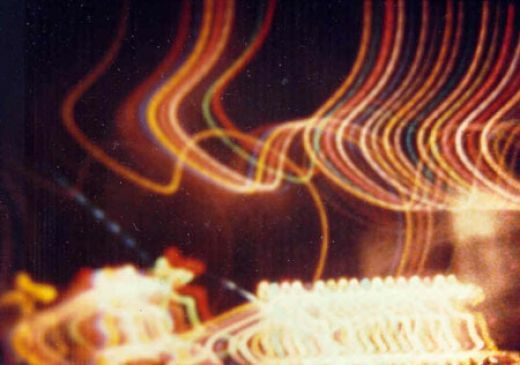 The lights seemed to be traveling in an almost V formation; however after a few minutes, the lighted objects seem to "dance" around one another. The objects were silent and moved in no way similar to conventional aircraft, fireworks, meteors or other natural phenomenon. Several people reported the lights to authorities, and CFB 22 Wing base was notified.  One witness was able to take a photograph at 8:45 pm, before the incident ended. 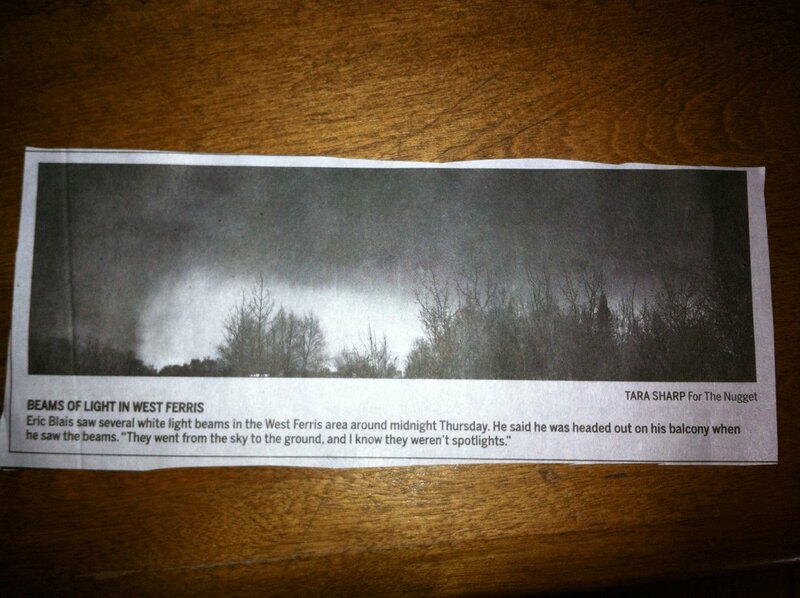 The photo was published Dec. 27, 2012 by The North Bay nugget. The nugget also claims the following day of the incident, Christmas Day, pillars of lights were spotted in the cranberry peninsula of Lake Nippissing. There is no evidence of a connection, but these sightings and phenomenon are rarely reported in the area. In my opinion, what I witnessed was not an aircraft, celestial body, fireworks, spotlights or any other simple explanation. I feel obligated to make a detailed account of what was seen. It was very strange. "Hi I just read your letter in the Northern Life. On New Year's morning, say 00:05, we too saw five globes go across the northern sky in Sudbury. We live in Moonglo. 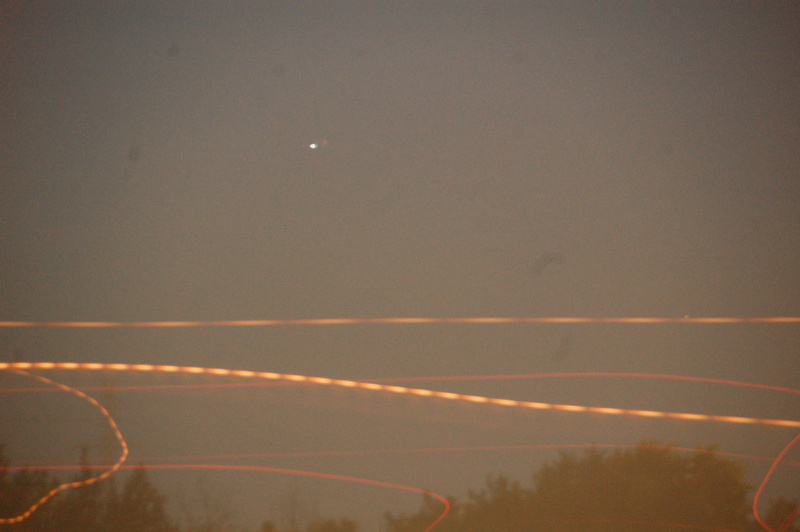 Then once they were gone, a single same light went by on the same trajectory. They travelled NW to SE . What alerted me was my dog on the deck began barking. I got some very poor video. There was no sound and it was not light from a satellite, I've seen lots of those. So I did some research. No one mentioned these particular ones on that night but others stated they thought they were Chinese lanterns on other nights. The trajectories were exact from the group to the single. I've just checked and the wind direction that night from Env Canada and it was 340deg or from the NW. Which means something floating would have gone in that direction. On November 17th, 2012 at approx 7pm we were playing in our back yard in Capreol with the grandkids. Our dog started barking looking up in the sky towards the south east. 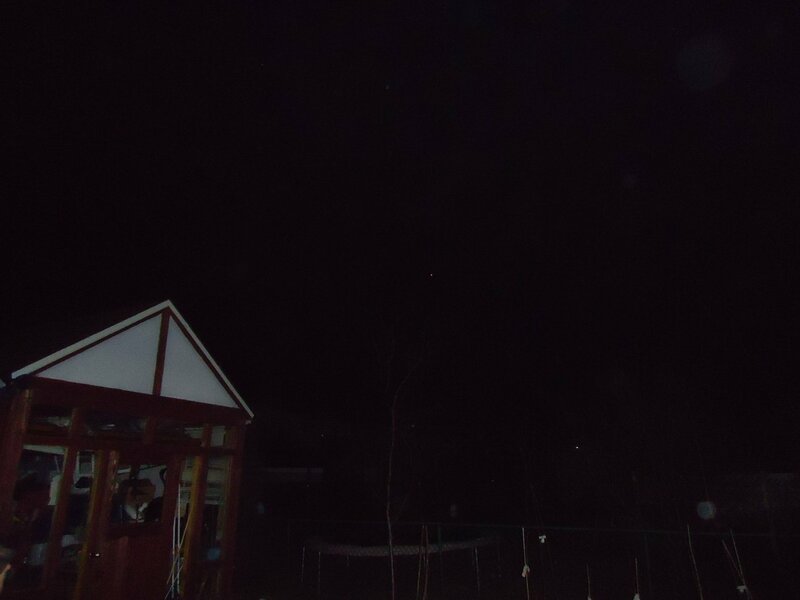 When we looked towards what the dog was looking at we seen 7 red balls appearing one shortly after another in the sky first appearing over the neighbors roof top arcing up into the clear night sky at a high rate of speed until they could no longer be seen. Their was no sound with these items. After the first two I grabbed my camera and took the attached pictures (note you will need to enlarge some to get a better view of the red balls). We continued to watch theses things appear one shortly after another seeming to keep the same arc into the sky. Their was a person driving by with a van who also stopped and watched. It took a wile to sink in what we were watching, I was abit concerned on the last two because of the way they appeared over the neighbors roof top (they looked close to the roof top but I suspect were a couple of thousand feet due to the angle and distance) traveling at a high rate of speed with no sound and their size. Note the pictures I have match the ones others took in December on the noufors.com web site. As a licensed pilot and aircraft engineer I tried to make sense of this, aircraft have a red light on the left wing, white on the tail and green on the right wing with white strobes, if it was a aircraft as it climbed in the sky I should have seen the white tail light but their was none, also no strobes, the red light was larger than normal which can happen if there is some cloud to refract the light but the night was clear and calm. The big one was no sound for something so large, close and fast note the night was calm so no wind to move or mask noise, shortly after I did hear Bearskin coming over on approach to the airport. A few days after I contacted Sudbury Flight services at the airport to ask about traffic around this time, I was told their was a Bearskin flight which I hear, a Jazz flight which approached from the south east which I would not of hear and a military C130 turbo prop earlier than my 7PM timeline. They confirmed the military aircraft was just passing by and not dropping flares or jumpers. I did not pursue it any further figuring it would show up in the media if others had seen this. I am glad the Northern Life published this article. Let me know if there are any questions, note I am going to contact the Northern Life and also thank them for running the article. Thank you for contributing your letter to the editor in February 12th issue of the Northern Life. The anecdotes describing peculiar lights in the sky validated a sighting of my own. Were it not for this timely article, I would never have disclosed the details of what I saw last autumn. 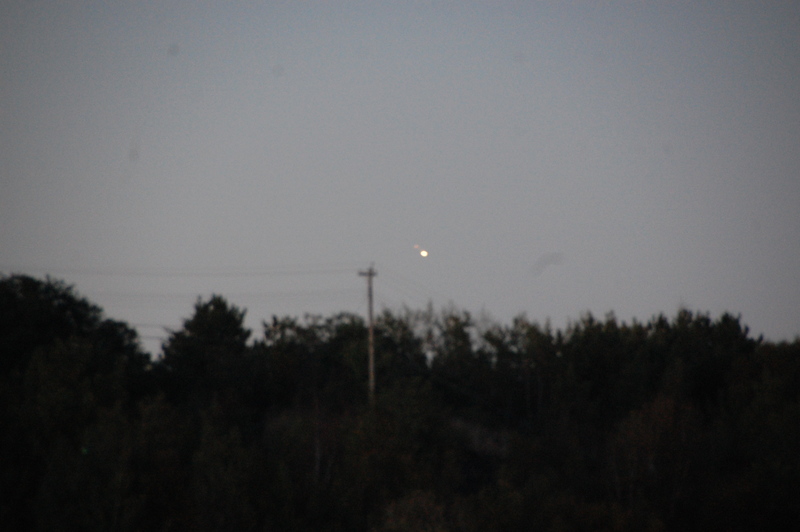 On a Wednesday evening last autumn, just before dusk, as my husband and I were returning from bible study in Lively, Ontario, I was bemused at seeing three brilliant orange globes hovering in a roughly triangular formation. We were on highway 17 approaching the Long Lake off ramp into Sudbury, they were on our left. The three orbs gradually widened their formation, hovered once again, then shot sharply toward north. They abruptly disappeared - they did not fade into the far distance - they simply ceased to be visible. Suffice to say, we were quite shaken. The entire event lasted perhaps 1 minute, but that moment is forever planted in our memory. We are very quiet and private persons so relating this event is a first for us. Thank you for providing the arena in which to share such things. "Well to begin I didn't know a site like yours existed till reading the northern life on Tuesday. I wish I had a month ago. I can't remember the date. All I know is it was either a Monday or Friday between Christmas and new years, around 11:00 a.m. -12:00 Noon. I remember it was a very nice clear sunny day. I know it was around that time cause I was on my way to work and my schedule never changes, always worked the same noon Mondays and Fridays. My girlfriend and I both seen it. We were on highway 69 north, driving into Sudbury from Val Caron. We noticed it around track and wheels, and watched it just hover over the sky. It appeared to be roughly over new Sudbury or at least in that direction. Wouldn't be able to say for sure. It was just hovering there. We could tell it was not a plane or helicopter, because it was cigar shaped. It didn't move at least not while we were watching it. Once we went down the hill into the corner of Lasalle and Notre Damn we lost sight of it. As I said I was on my way to work so I couldn't stop. I hope someone else seen it, cause it scared the crap out of both of us. "Hello Michel, I read your letter in Northern Life and it inspired me to write about a similar sighting I had in 2012. I'll try to keep this email as brief as possible about a sighting a friend and I witnessed July 8 2012..... 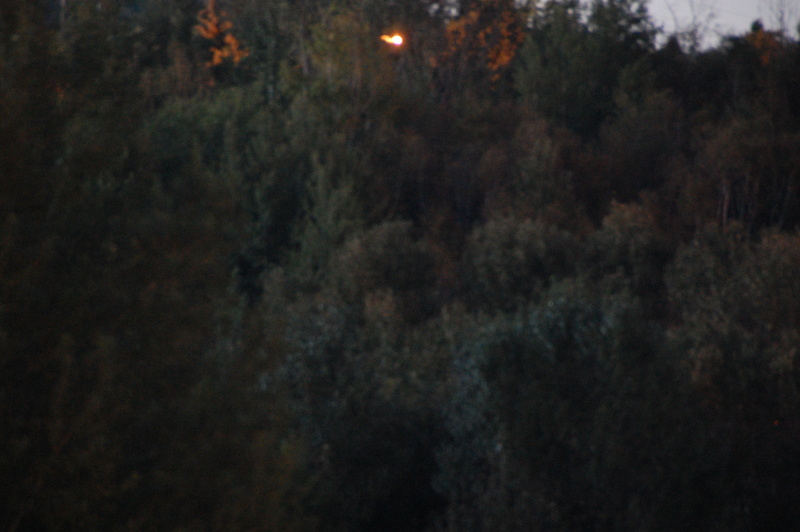 It was 8:30pm (still some daylight); we were walking in Gatchell area when I noticed a red ball of light in the sky. Trying to figure out what this was, I found myself running towards the object. As I was running, I also noticed other people pointing towards the object in the sky. I reached the end of the street and stopped to look at it. That is when I noticed there were 6 balls. 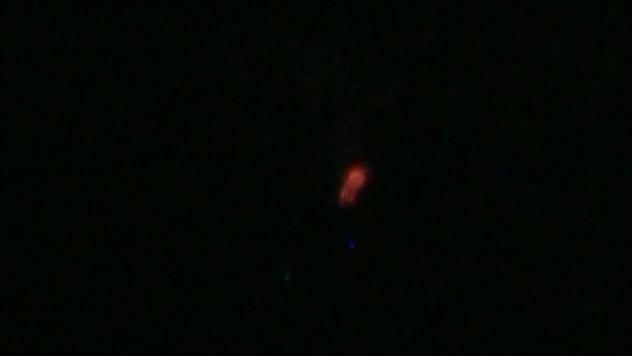 They were very bright, fiery reddish- orange with a bluish green center, approx. 50' in diameter and appeared to be perfectly round as well as the center. These objects made no sound whatsoever. They were traveling from Copper Cliff area towards me. At this time, they appeared to be approx 400' from me and approx 300' feet in the sky. Then, the objects stopped as if they realized that they were traveling towards a populated area. Then, they changed direction. 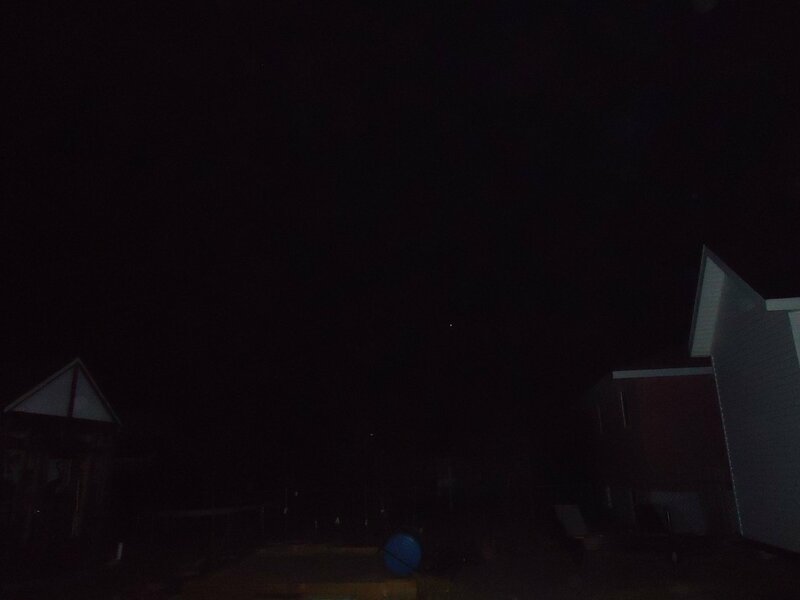 The objects started traveling away from where I was standing and towards the sky on a 45 degree angle. As I continued to watch these objects, one ball would move downwards; another ball opposite from it would move upwards. Similar to wings on a plane when it turns, one wing lowers while the other one raises. I watched these balls until they faded into the cloud cover. The entire sighting lasted approx. 20-25 minutes. I tried to find a logical explanation for these, maybe Chinese lanterns or a balloon but I wasn't able to. The time was between 10:15 and 10:30 p.m. On February 23, four witnesses (a woman, her boyfriend, his nephew and his wife) were travelling down Landry Street in Azilda, looking towards the direction of Sudbury Downs. They noticed two round objects, white in colour, that looked like fireworks in the sky because they were giving off sparks. They continued to watch and realized that they were not fireworks, so they proceeded to get out of their vehicle and continue their observation.  Suddenly, a third object with a red light flew towards the first two, but at a higher altitude. The three objects then moved off, with the first two objects climbing higher until they faded to nothing. 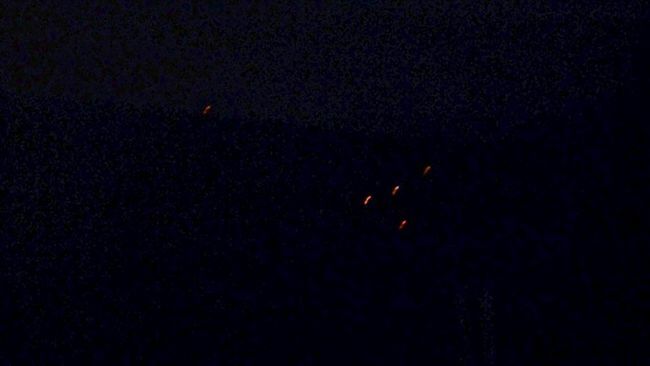 Reported to Todd Fraser by C. T.
On March 5, I was told by a co-worker that her younger sister, who resides in Wahnapitae, witnessed some strange lights that would hover and then blink off, only to blink on again, then dart off in every direction. 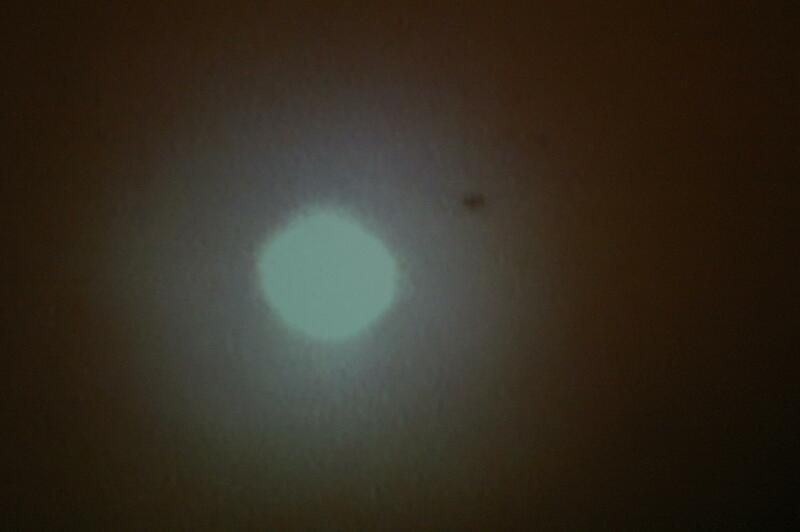 This sighting occurred around 8 p.m. on March 4. The witness is reluctant to meet, or even talk with me, but I'm hoping to get more details as time goes by. "...Ever since I found your website, I went from having a slight interest in the stars to spending most of my free time watching them. One of the strangest things I've ever seen in my life was with my parents about 80 km north of cochrane, camping out in the woods around 2 p.m. It was cloudy and raining. We looked out from our camper trailer and saw a J-shaped object; it had arms on the top like a capital T but had a bulbous part sticking up like a capital J. We watched it float about 5 feet over the water. It traveled at least 100 meters. As it turned, it retained its shape, making me believe it had to have actual structure. I estimate it was 7 feet from side to side and at least 15-20 feet tall. It made a couple of maneuvers before returning to its original position, and then within two or three seconds, it was up over the trees and gone. It had white looking edges and appeared to be translucent. And I will be sure to come to you with anything else interesting I spot. I'd like to thank you in advance for the work you're doing to bring this subject to the front line." "I found your website while reading articles about the increase in UFO sightings as posted in the Toronto Star. I would like to share my own sightings and ask you whether this is common or explained in any way. Having been a regular observer of the night sky most of my life, I can say that what I have been seeing, quite regularly over the last three years or so, is unusual in my experience. 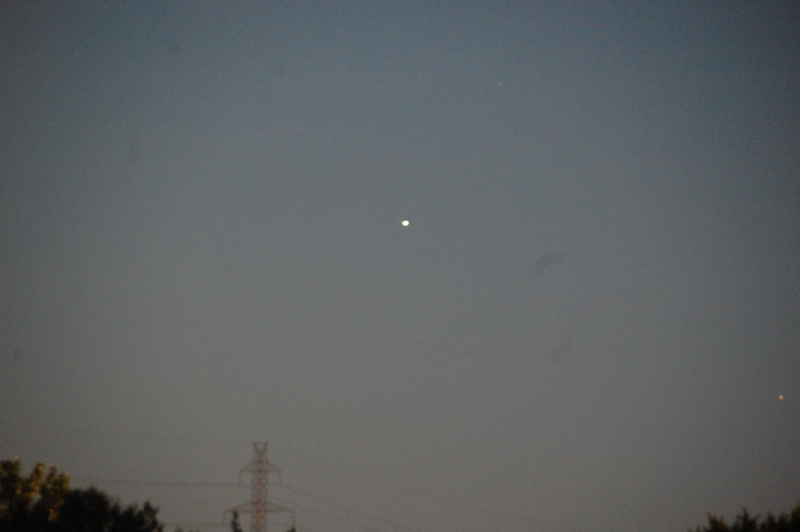 No fancy coloured lights or anything, but what looks just like a star, like what a star looks like to any naked-eye observer, but about 15 times larger, moving in the sky. It sometimes just follows a straight trajectory and eventually fades away in the distance, or sometimes, it stops, seems to hover, and then shoots away quickly. Sometimes it stops and changes the direction of its course completely. I've seen it at Bell Park, Windy Lake, from my place in the Valley which is near the airport - it is very different than a plane, there is a distinct difference in the way and speed they move. Planes have flashing lights, these do not appear to. I just know they are not planes. In any case, would like to know if you can shed any light on this." "My friend was leaving my house last night and when at the corner of Michelle Drive and the highway in Hanmer, by the funeral home, he saw something crazy. 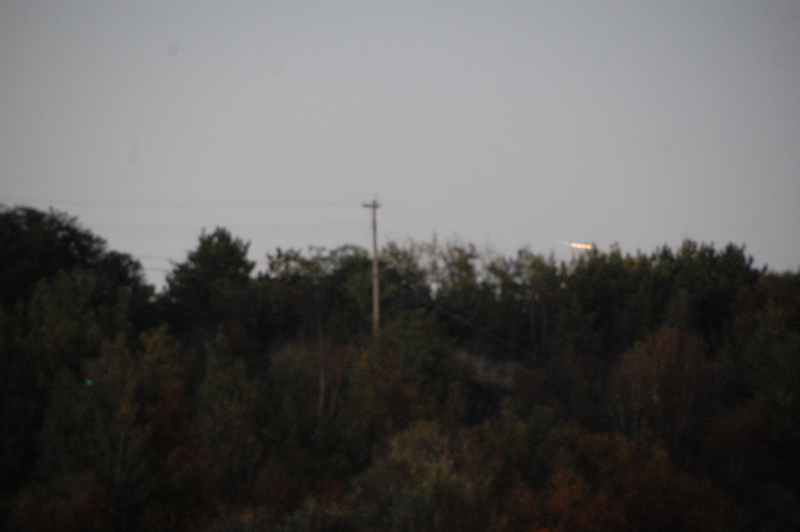 Facing southeast towards radar road, he saw hovering light, seemingly spinning underneath and changing colors. It changed into bright blue vertical beams. His sighting lasted about 5 minutes. He pulled into the funeral home parking lot and tried to take a video but it was too dark. 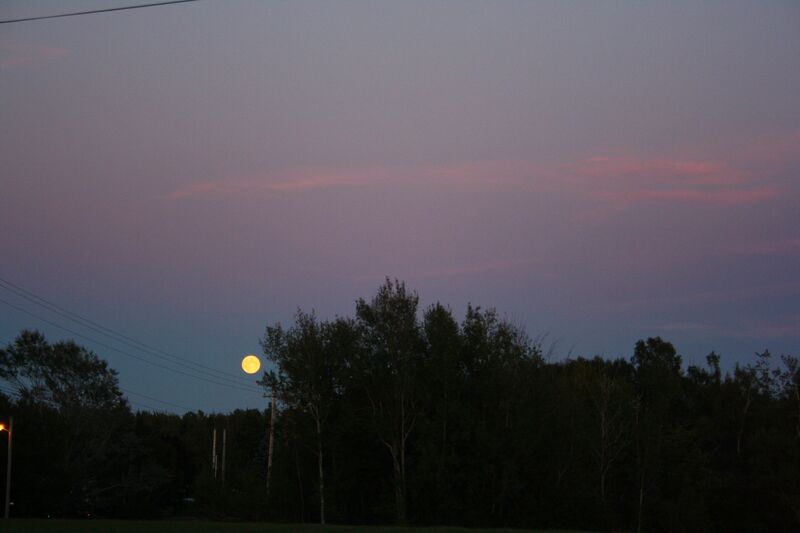 The moon was south in the sky at his 2 oclock, with the lights at 11 oclock, high in the night sky. Stayed stationary blue vert. Lights went back to bottom oval lights circling, and then disappeared." "I know of many many people who've seen things in the Sudbury area. In the early 80's, my ex-hubby saw a definite craft when he was flying a plane. They (him and his co-pilot) saw bright lights over the Veuve River by Highway 17 in the Markstay area. As they got closer, it came up off the river and then sped away at unbelieveable speed. He said the light was so bright, it illuminated a huge area. This sighting caused him great fear and made him afraid of aliens. They reported it to air traffic and also logged it in their flight log books." "I remember too that he said they were flying a small plane, it was night. They were flying low towards Sudbury. As they came around, they could see bright lights lighting up the whole area and the river. At first, he thought it was a car accident, gone into the river. Lights being search lights. But as they got to it, he saw that it was a metal craft; cicular I think he said. But it came up off the water and higher than the plane, and shot off very very quickly. The only thing I've ever seen petrify him is aliens, and that sighting was why." "Hi, I have a UFO sighting to report. 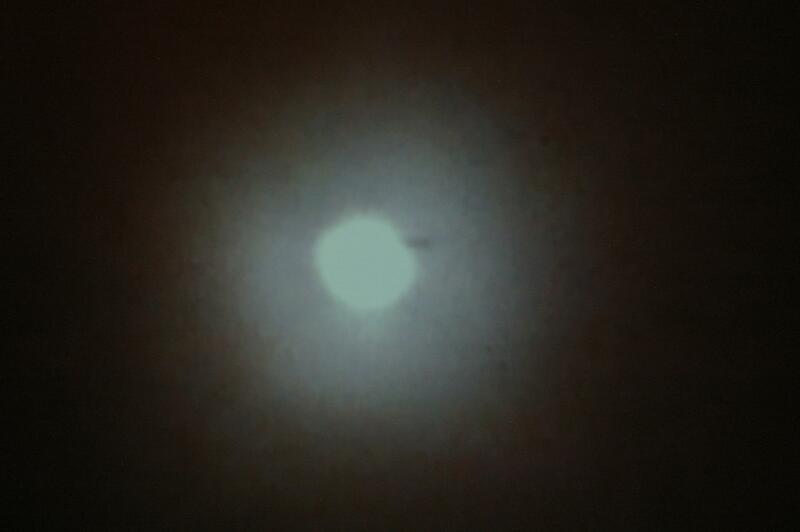 I was out on my balcony watching for any UFO's when I saw a fairly bright light moving across the sky. I have been interested in UFOs for many years, and have learned to watch for movement pattens. This light was fairly consistent, but seemed to be moving somewhat quickly. It faded away very suddenly, then approximately 2 seconds later, there was a bright flash on what would have been its course. I began to read reports of sightings on your website, and found one from June 14, 2012 in Chelmsford, On. This sighting sounds identical to mine. It was an incredible sighting." I drive cab for a living and last night about 11:15 p.m'ish, I was sent to whitaker street to pic up @ 227 whitaker. I got there early. 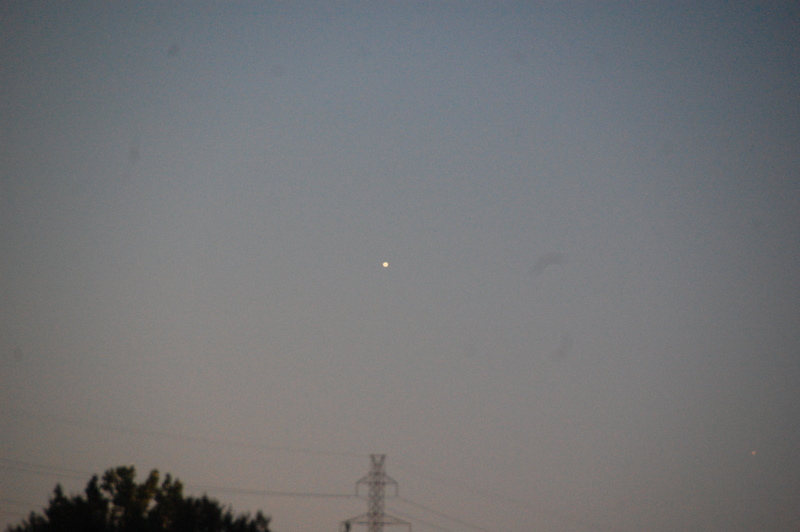 I noticed up in the sky 2 glowing orange objects about 1500 to 2000 feet up - maybe higher - coming towards me, passing overhead. They were heading in a westerly direction towards Copper Cliff. I got out of my cab to watch them go by. They glowed orange and were moving at a good steady pace with distance between them both, not wavering from that as they passed overhead. They had rapid flashing lights on them. I turned down my radio and cupped my ear to my head and they didn't make a sound as they passed over. Has anybody else reported this....?" "Hi Michel! I've witnessed 3 UFOS in the west end area last night. They were orange and were floating very close to each other. I thought it was immense exposure as they were in the open. I guess somebody sought to find out what it was and then it came onto the news via radio, stating chinese lanterns? 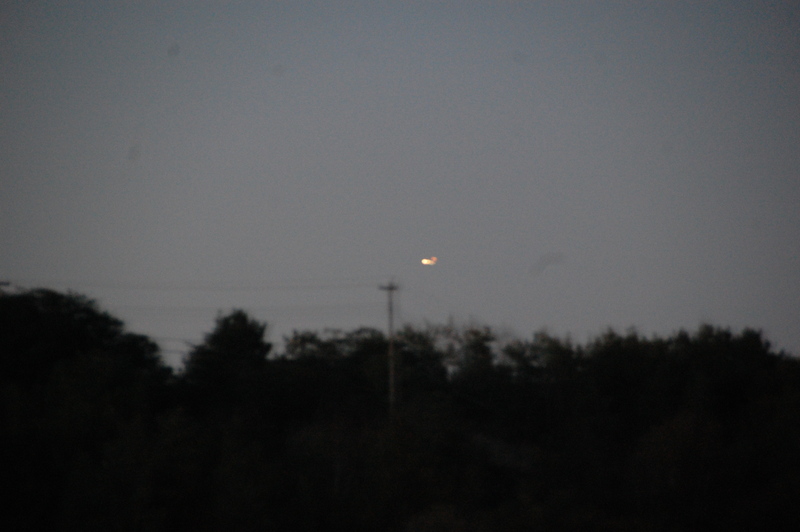 I know there's a lot of unpredictability when determining a UFO, but that can't be right. How disingenuous is that?" On July 9th, three of my neighbours told me about the sightings that they had during the evening of Canada Day. It seems that there was a lot more than just fireworks and Chinese lanterns in the sky, that night. Reddish round balls of light made three successive passes above the city, traveling in a straight line, one behind the other, with equal spacing in between them. The first sighting consisted of two objects, red in color with a halo of haze around their edges...just like the mirage effect you get off the pavement during a hot summer day. 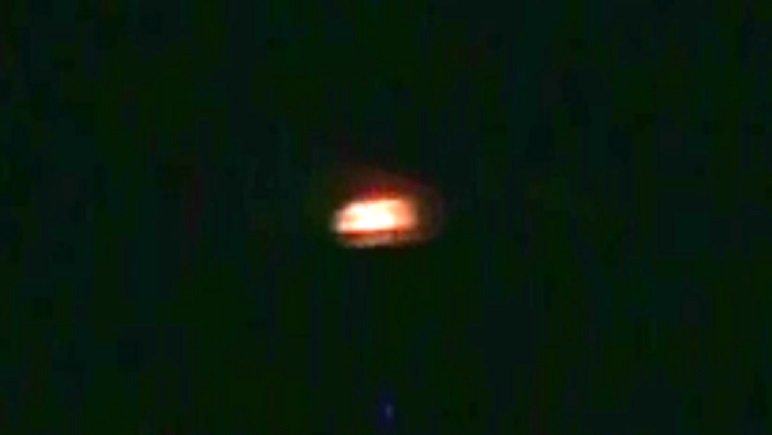 The second sighting was of three similar objects, but coming back from the opposite direction. And finally, the third sighting was, again, of three objects...described in a similar fashion as the first two sightings. From the ground, the witnesses also spotted a small plane circling around as if the pilot was scanning the skies for these things. One of the witnesses said that the objects seemed to be about twice the size of the small plane, possibly because they were at a lower altitude than the plane was. 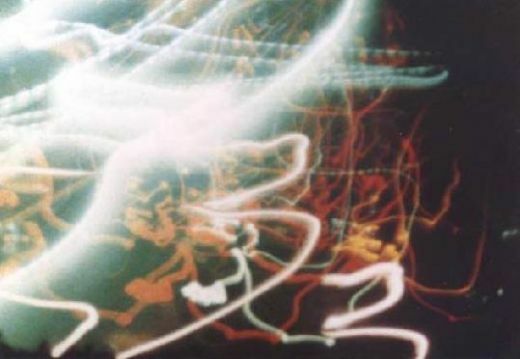 Another report was of a lighted object that sudenly flashed before disappearing, giving the impression of a blinding flash you get from a camera. Chinese lanterns don't travel in a straight line as they are easily affected by the wind's direction. Also, their dimensions are nowhere near that of an airplane. Not do they produce a blinding flash of light and suddenly disappear from view. So what is it that is flying around in our airspace? 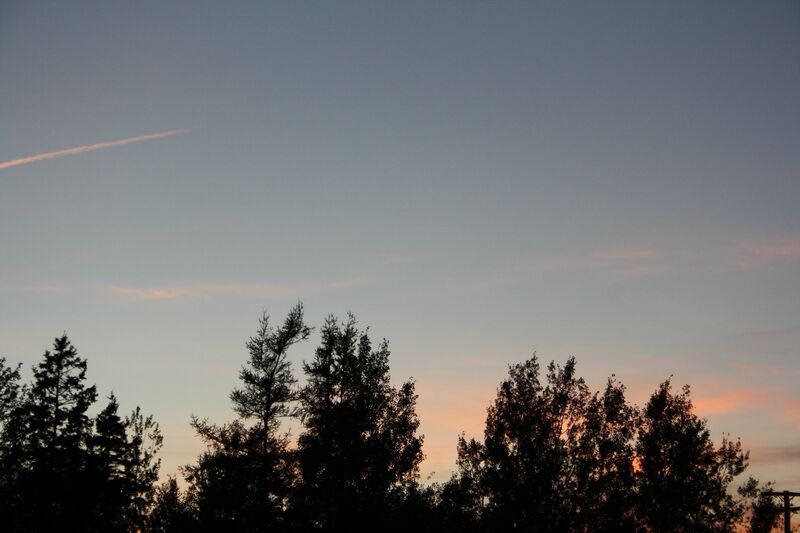 I watched a UFO fly over my neighbourhood Saturday night, around 8 pm. 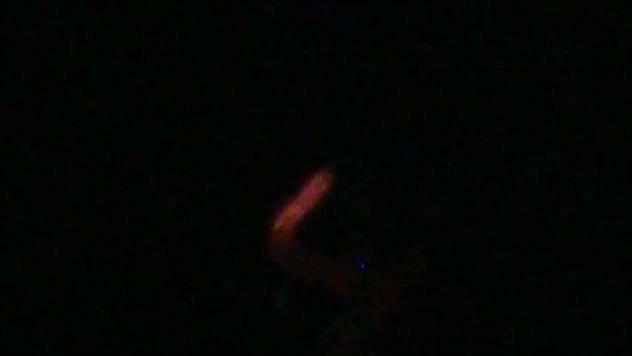 It was amazing - triangle-shaped and had one bright orange light in the middle of it. It didn't make a sound and didn't look like anything I ever saw in my life. It happened in the Minnow Lake area; my neighbour seen it as well. 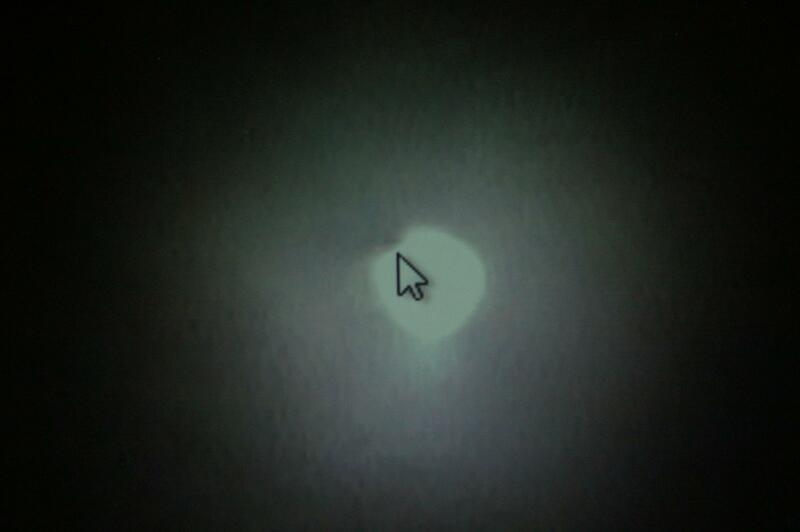 Well, I looked at the ufo diagrams you have and all the pics are as if you are looking at it eye level...all I could see was the belly of the craft...which was triangle-shaped and a bright orange light in the middle of it. It came from the south heading north...perpendicular to Eaglestone crt off of 3rd Ave. 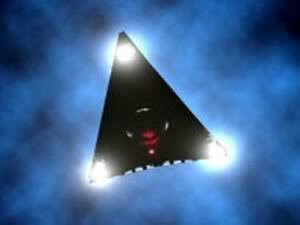 It looked like this, but no white lights on the corners....just the orange light in the center of the craft." No sound that's what initially gaave me the sense it was a ufo and when it got right over me, I could see the shape which was a triangle...slower than a plane would travel and I'd say it was no more than 3000-5000 ft in the air. 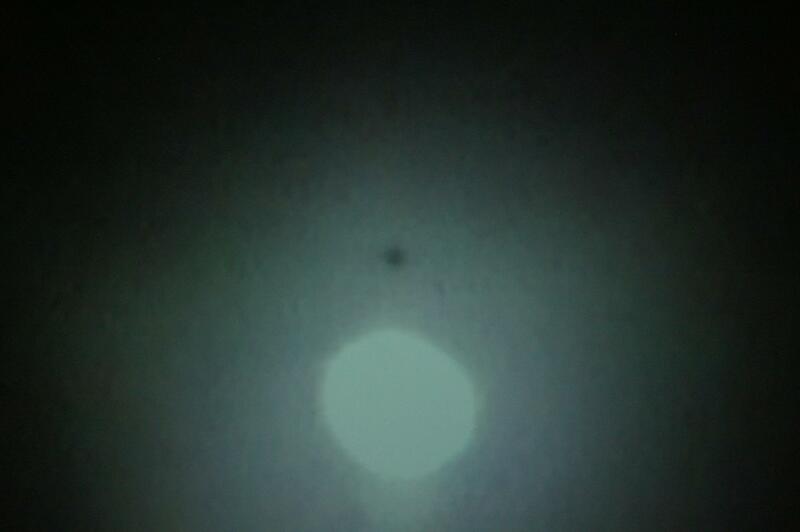 There was a haze over the shape but could still make out the dark triangle shape of the craft...and it moved north to south. "I don't have much of a story about what I saw but I do know it qualifies as unknown. Saturday July 13th 2013 while sitting on my cottage dock in Bancroft at approximately 2:00pm I witnessed a silver/grey object in the northern clouds following a very strange flight pattern. It was only in my sights for about 15 seconds but it was odd enough that it caused the skyline to hold my attention for several hours after I lost sight of it. I was curious to see if there were any other reports on that day, I did some searching but have yet to find anything." "Not sure what it was. It wasn't a helicopter or a plane. 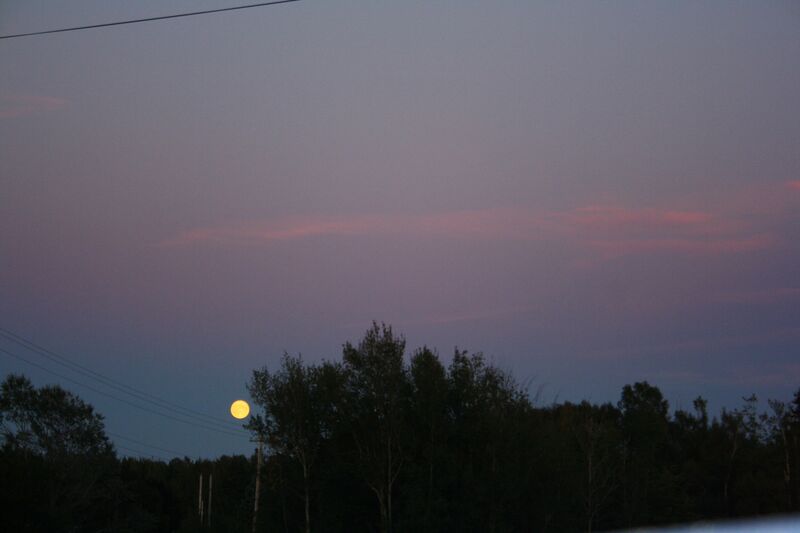 I saw it above petawawa early this morning, 2:30 a.m. It went across the sky (6 inches of my vision). 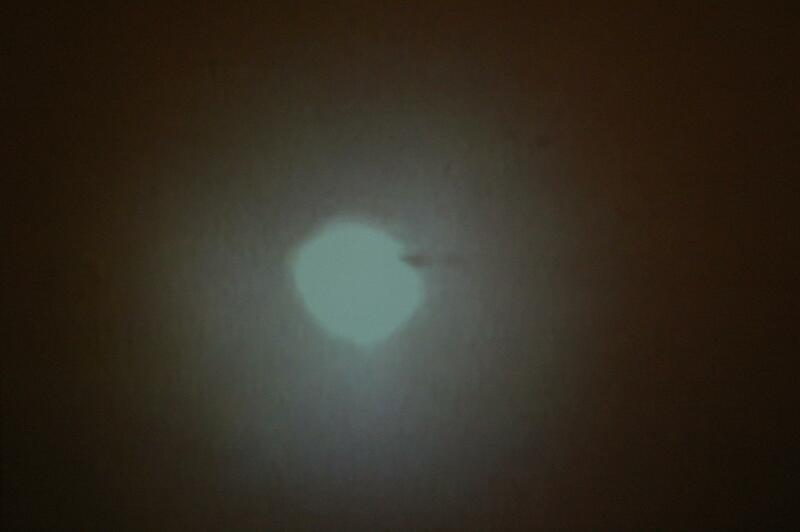 It started very bright white but as it traveled, it dimmed to nothing. It reappeared behind its original position and carried on towards the north. Dimmer on the reappearance. It didn't look right. Hope this helps." "I would also like to add that the light "came from" the big dipper. And its original path was north to south, then reappeared behind its original point and traveled south to north (above the base by my guess) thanks." like a battle or attack between one large object and a couple of smaller UFOs. captured a group of objects maneuvering within an exposure time of 9 seconds! with the last frame taken by Ken Klingbell (above). On Thursday, September 26, I was visiting with a young couple that I know when I was told that while standing outside on a July evening, the man had been looking at what he thought were a couple of bright stars in the night sky. All of a sudden, the "stars" both took off in the same direction, one behind the other, as if they were in tandem, while keeping the same distance between each other as they moved at a rapid rate of speed. He is at a complete loss to explain what he had seen during that July evening. 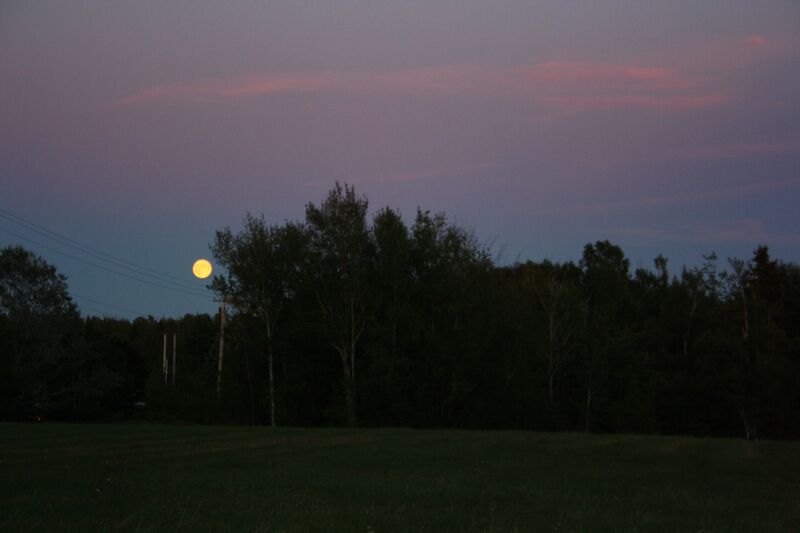 "These were taken September 19th, 2013 here in Caribou, NS, Just outside of Pictou, Nova Scotia, Canada - on family property. I have them in named in the order they were taken and timed stamped by my camera. "These are original and untouched photos. There are others before and after, general scenery shots of the area being taken at the time. We did NOT notice the orb when the pictures were taken. Only after, looking at them October 1st, looking through photos, noticed the image on 7014 and then discovered the second on 7016 and pieced the sequence of events together. "When I saw these the other day, like I said looking through some pictures we took, taking a second look at 7014....what IS that. The moon's coming up and that isn't ....mars? The thing is way to big. My camera lens isnt that powerful!  blew it up and noticed the reflection of the moon on the left hand side of this perfectly round ball. What? "After a few minutes I check on the remaining photos in sequence, and notice on photo 7016 there it is again, and gone in the next shot 7017 taken a few seconds later. Not right after, as we were not taking pictures of this object (had no idea it was on the photo), we were taking pictures of the pink sky in the case of 7016 and 7017. Again, if it was something floating in the air like a cloud or a balloon etc., shouldnt it still be there 24 seconds later? Moving!! The numbers on the far right (7011 through 7017) are the picture numbers assigned by my camera. The camera also records the time of the pictures, dates, speed, and aperture. Between image 7014 and 7016 is only 40 seconds at that altitude, must equate to quite a distance in 40 seconds. The distance travelled between picture 7014 (facing East) and 7016 (facing South) is quite large in a time of 40 seconds and results in a complete directional change (photographers vantage) from east to south. 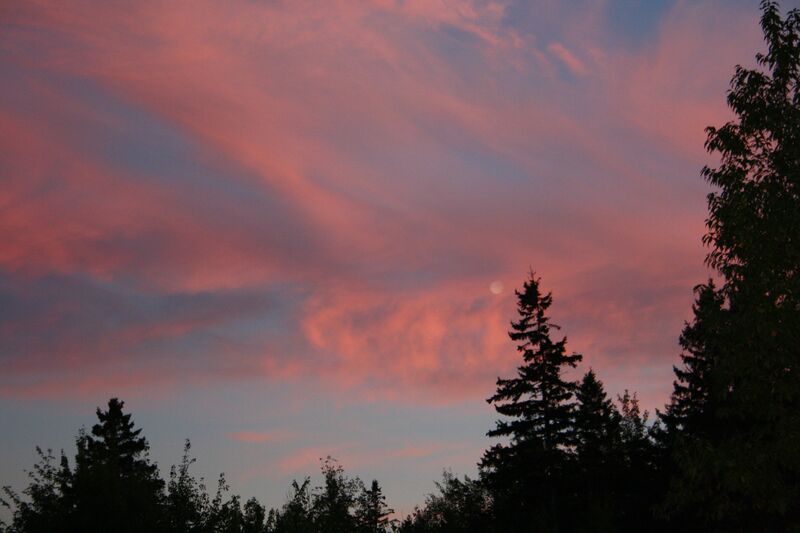 We had no chance of seeing this when we took pictures of the beautiful moon and pink sky at night. This thing was moving too fast obviously. Again, we only noticed the (what I now call the orb) round spot on the first picture 7014 a couple of days ago and started questioning. Have shared this with some family members here, they seem to agree there is something in the photo. Of course, they know me and it was interesting that my nephew said if it was coming from someone he didnt know, didnt recognize the property, knew I wouldnt have any interest in putting themselves out there he would have dismissed these images. I might possibly have said the same thing. Makes you reflect on the other stories you hear. The first shot (7011 through 7014) we are looking East. Picture 7015 moving from east to west. Pictures 7016 and 7017 are facing south. So a fairly large piece of sky for something to move so quickly across. How many miles at that altitude in 30 seconds!? These pictures have good enough resolution to blow them up fairly large (you lose focus after a bit) but the shape is round. No matter how big you blow it up, the edges don't distort. It isn't a cloud or a wisp of smoke. The pink picture, 7016 shows the image quite clearly again. We had no idea these images were on here. Doesn't appear to be an "airplane" or "swamp gas" to me. And the distance it moved it that time....no wonder the naked eye doesn't see this stuff. This isn't a joke...I have the original photos (date and time stamped) unaltered and no skills, software, time nor interest to play games. "Hi, my name is ________ . I live in Chelmsford and I am 25 years old. Although I was hesitant to write you, I decided to do it anyway; I mean, what do I have to lose. Just a few minutes ago, I was outside having a smoke looking to the west sky as I always do, and I heard a sound like a whistle for a good 3 seconds then a snap and at the same time as the snap, a light in the sky rushed up and disappeared and the fog that was surrounding me had... I don't know..? been affected by a "force" of some kind like it was pushed away from me. My whole body was covered in goose bumps and my hair was standing on end because I knew it was real." On October 23, I received a message via Facebook from a resident of Sault Ste. Marie, Michigan who reported that in 2007, while in Sault Ste. 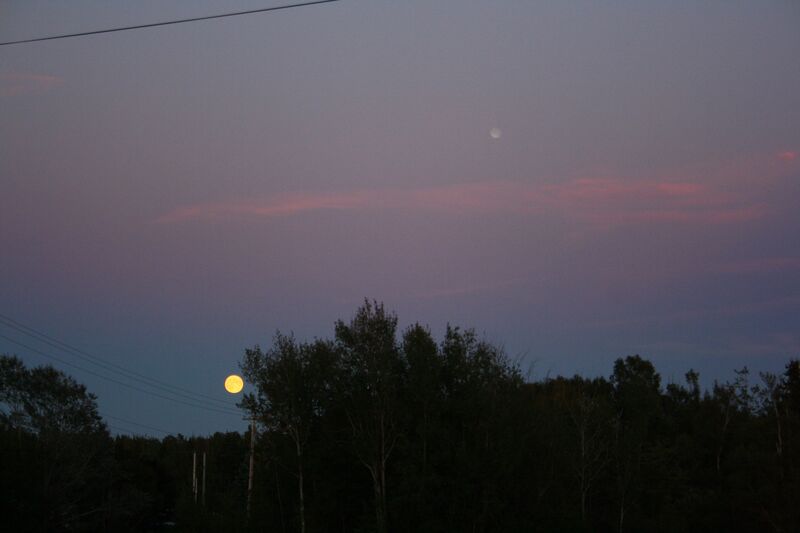 Marie, Ontario, he and another witness had seen a large rectangular object in the sky. See 2007 for his report. 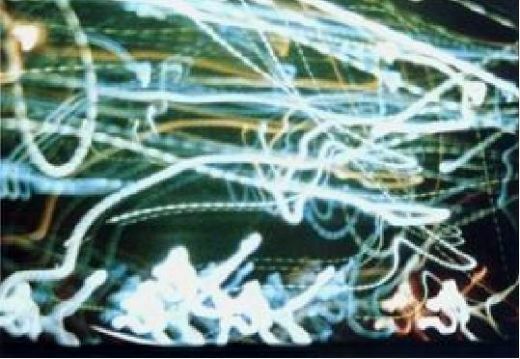 A co-worker of mine [C. L.] told me of a sighting he had, a couple of years ago, of a very large triangle that consisted of three red lights. The red lights resembled those you find on communication towers, except that they weren't flashing or pulsating. 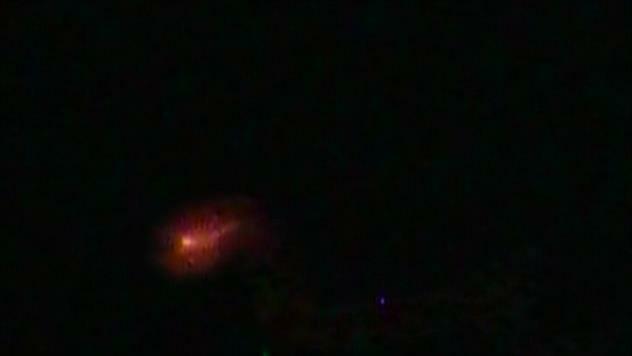 After watching it for a few seconds or so, the three red lights took off in different directions, one after the other. 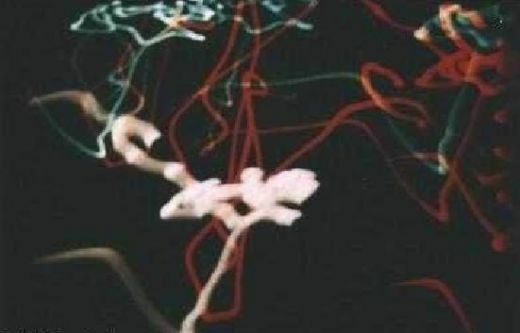 He has no idea what it was that he saw, but said that when he first saw this, the red lights were moving in unison and the triangle they were forming was extremely large. Date: November and , at around 5 p.m.
A friend of mine, who works at the Taxation Center, told me of an unusual sighting that was witnessed by some members of the staff there, on two separate occasions. 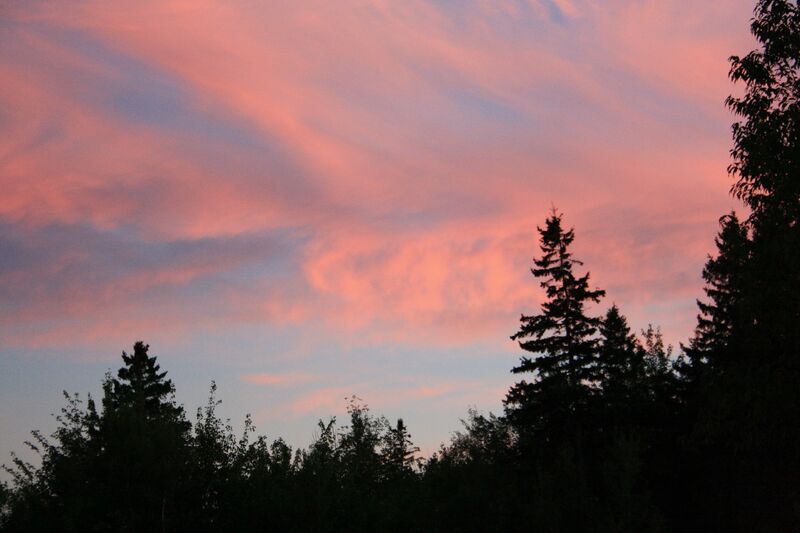 He said that while looking south, in the direction of Pioneer Manor, they saw an unusual light in the sky. 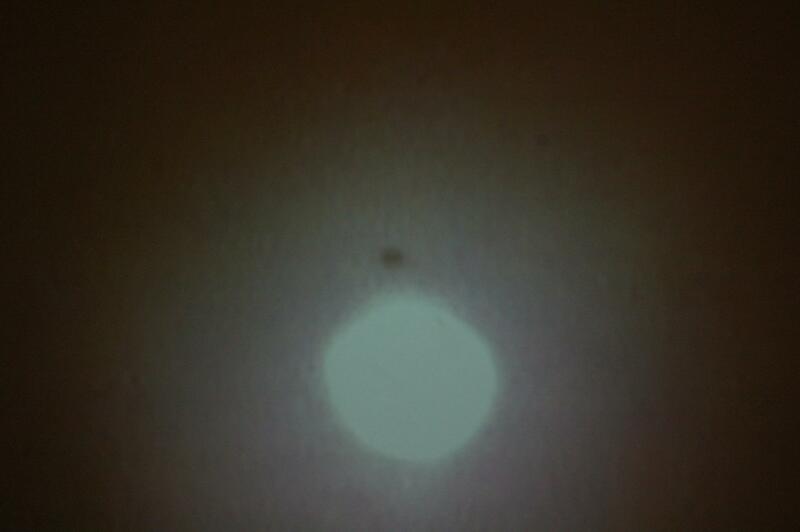 It was described as being about the size of a street light, and was visible for almost fifteen minutes.